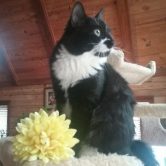 All kitties rescued by Dr McLeod currently have homes! 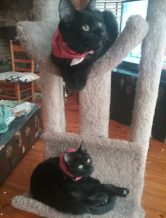 Below are other cats in search of a new home. Please call us for owners information at 336-235-0770. 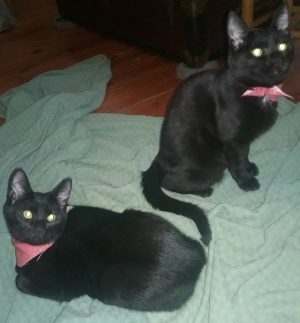 Two black shorthair males, brothers, Fiv tested, microchipped, all shots, neutered, about 7 months old. Have few white hairs under their chins. Very playful, talkative, love to cuddle. Would be great if they could be adopted together as they were dumped together in the cold and are very bonded. Cece = female, med longhair, spayed, all shots, tested, microchipped. About 14 mo., loves to be petted, acts silly, but is a laid back sweetheart. Indoor cat. 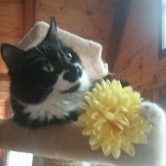 Tator = male, shorthair, neutered, all shots, tested, microchipped. About 1 year old, loves to play, very active, doesn’t want to be held or petted, but with more attention to just him he should come around. Lays close to humans and follows them around. Plays very well with other cats. Please call Annie at 336-235-0770 if you are interested in one of these kitties.